Before I write down my race plans for 2011 I want to pass on my congratulations to my good friend John McLaughlin who ran 2hrs 59mins 30secs in the Loch Ness Marathon yesterday, thus beating his marathon pb (from London this year) by 8secs! Another superb run with even splits for the two halves. Well done John and go for that hat-trick of pb’s at London 2011. I’ve ran a lot with John over the last few years and I know how hard he has worked for these sub 3hr times. Congratulations to everyone else who ran at Loch Ness! Even though the year is not yet over I feel as though my running year is! Over the last few months before 2011 I plan to keep running but without a clear training plan. The priority is to get my new insoles (due to arrive in the next couple of weeks) bedded in and give my body time to recover and rest after running 10 ultras in the last 18 months. 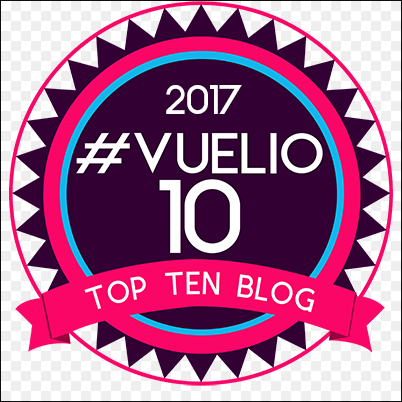 No doubt I’ll do a review of the year in December but I’ve been thinking a lot about what I’d like to do next year. 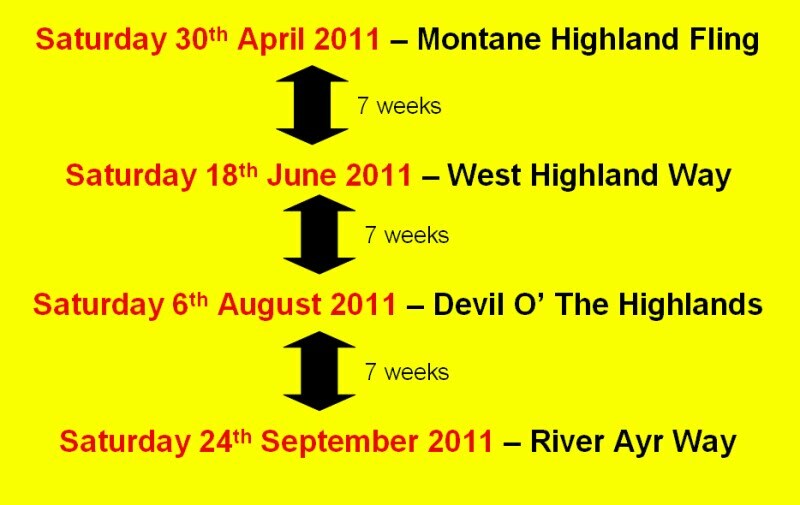 I started with the thought that I want to make the West Highland Way Race my priority for 2011. I know there are lots of other races out there and some of them I would love to do but basically I love the whw race and want to make this one my priority for next year once again. This year I took the decision to do things a bit differently and feel that I sacrificed quality for quantity. I did more races but found that I didn’t run as well as I’d hoped especially in the Fling and whw. So for 2011 I’m going to go back to what I did in 2007-2009 and make the whw my priority. All my eggs in one basket is risky in some ways but the rewards can be satisfying. I’ll also run the Montane Highland Fling in April as a key part of that preparation. Next year will be my fifth running of the Fling and whw. So having sorted out my race plans for the first half of the year I thought about what else I’d like to do. The Lakeland 50 or Lakeland 100 really appeals to me and I was keen to enter one of them but I have decided against that as I realised that the Scottish Ultra Marathon Series (SUMS) is also important to me. I enjoyed the competition in the Super Vets this year and feel that doing well next year is my second main priority. I know full well that if the likes of Roger Greenaway, Bill Maxwell, Bob Allison to name a few run 4 races next year I’ll be struggling to make the top 3, especially if John Kennedy and Bill Hutchison (who finished 1st & 2nd this year) plan to run again but I enjoy the challenge. I need to run 4 races in the SUMS to qualify. I only want to run 4 ultra races next year and I’d like to space them out. So even though I really enjoyed running the Hardmoors 55 and the Cateran Trail race this year I’m going to give them a miss next year. I also don’t want to do any races before the Fling so that rules out Deeside 33 and the Glasgow to Edinburgh. I am going to do the River Ayr Way Race again in September as I feel I have some unfinished business from this year. I’d love to do it injury free and see what I could manage. So the Fling, whw and RAW make up three of my four races. Initially I thought of doing the Stride race in July but decided against it as it is fairly flat and therefore attracts a lot of faster marathon type runners but mainly because it’s only 4 weeks after the whw. The Speyside is a long way from home and too close time wise to the RAW. So that leaves …. The Devil O’ the Highlands I ran this race last year and enjoyed it. Plus this gives me the added bonus of going for the Triple Crown (3 races on the whw route) again. 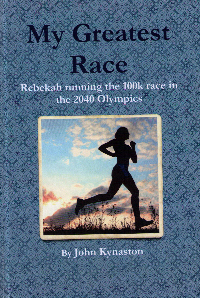 In 2009 I ran sub 10hrs for the Fling, sub 20hrs for the whw and sub 7hrs for the Devils. Can I do it again?? I reckon that’s a really good challenge for my level. I want to give myself the best chance I can to do well firstly in the whw and secondly in the SUMS. Summary of my race plans for 2011 …..
I’ve sent off my entries for the first three and will wait for the entries to open next year for the RAW. I’d be very happy to have a good solid year of running next year with no injuries and a couple of pb’s. Not too much to ask?? This entry was posted in 2011 race plans. Bookmark the permalink. So there we have it. My first public knockback and entries are not even open. Im only joking JK, plan makes perfect sence. Have you considered UTMB? You'd love it! Hi John, interesting plan and rationale. I'll soon be struggling with a similar dilemma. I would be interested to know the thinking behind your conclusion that more races means lower quality. I think I'm inclined to agree with this but I'm not sure whether it's because the races themselves take it out of you or because the races disrupt your training with their attendant tapering/recovery periods. If you chose to concentrate on your main races but included some others as “training runs with added interest”, with no taper or recovery, would that affect your performance? My Plan is very similar. WHW will be the top race for me. The Fling almost as important. Maybe the Devil (I never had a really good Devil, although I always enjoyed it).